(The most straightforward way) from the Highway 40/94 interchange: Take Highway 94 South approximately 13 miles. Go past Defiance to Matson, turn right and follow Matson Hill Rd to the top of the hill. Turn right onto Matson Road (now paved) and go ~ .5 mile to the trailhead, which will be on your left. Click Here for Park location. If the lot would fill up, parking is available at the Katy Trail Matson Depot at the junction of Hwy 94 and Matson Hill Road. You can carpool up from there. Why: We will put in one new reroute on the Matson Hill Loop and also perform much needed maintenance on Oxen Mill through the old cedar trail. Wear good supportive shoes and bring your water, there will be a bit of a hike to get to the work areas. Got Q's? 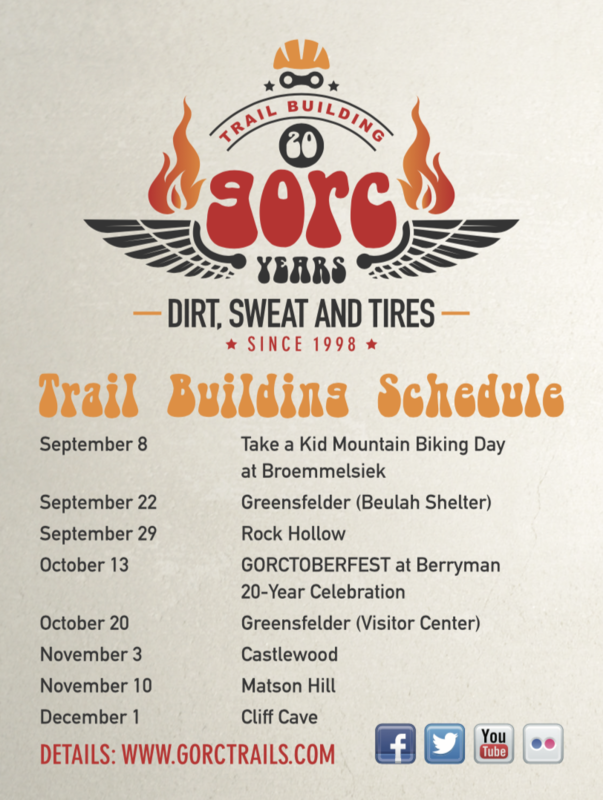 : Please read the link to pilznr's "What to expect at a Trail Build Day" - http://forum.gorctrails.com/index.php/topic/2265-what-to-expect-at-a-trail-building-day/. Or, post up here, and we'll do our best to answer things for ya. GORC/SCCP's will provide on site instruction, tools, gloves, safety glasses, and a post event lunch*. *Please contact us if you have any specific food requirements (veggie or food allergy), and we'll do our best to assist you. There may be a group ride afterwards - weather permitting, so bring your bike if you like.